So, it's Father's Day next weekend. Eeek! How did that happen? Yesterday afternoon, I suddenly realised I needed a card. Not because it's Father's Day next weekend. But, because I realised I had nothing to share with you for my Dies To Die For, or, Little Miss Muffet Stamps Inspiration this weekend! (Insert rude word here.) Yep. Eeek! Again. Do you have an image you reach for when you need to make something quick? I do. And for me, it's anything Bear. Bear. Not bare. I love colouring fur. I love the mess of it. And I love that I can just smoosh some ink about, and the messier I am, the furrier the bear looks. Perfecto. Honestly, it's just what I need if I'm being quick. Yesterday, I was being quick, so I chose Little Miss Muffet Stamps Theodore. Quick. And cute. Love it! Such an adorable card Faye. 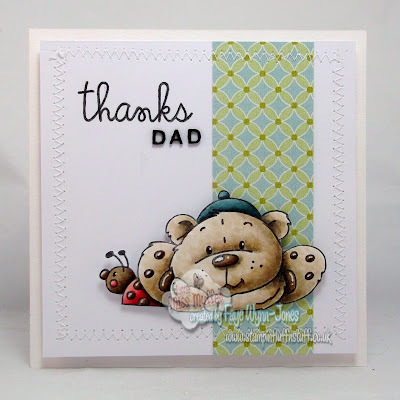 A gorgeous little Bear with his ladybug friend and coloured beautifully Faye...fabulous card. OK... 'Quick, Cute' - and absolutely FABULOUS!! Why can i never achieve wonderful CAS layouts like this?? LOL! 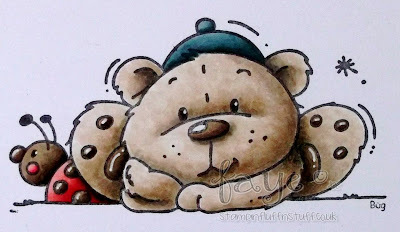 Awwww... this bear is so stinkin' cute!